Oh ghod, wouldn’t you know that when I’m hoping to wind down the farm, the ducks are hatching out another plan. Every year, I give the teachers at Washington Elementary some fertile duck eggs. It’s a really cool class project, where they hatch out the ducklings and the kids learn about science and life. This year, two separate classes did the project. Of the 10 eggs total given, 5 hatched. One of the teachers was really brave and conducted an autopsy on one of the unhatched eggs. I heard the smell was incredible. The kids sat far, far away. Teach’ figured out the eggs had gestated for 14 days, then stopped developing. The five that kept developing and eventually hatched out imprinted on the school kids. But with school letting out, they had to leave the classroom. So now the ducklings are back at my place. Yes, Virginia, I am going to eat them. I only have so much space…Don’t worry City of Oakland, I’m taking them up to a USDA slaughterhouse…. Actually, my plan is to get rid of the ducks entirely. Which is why I was chagrined when my neighbor came up to me yesterday and said, “The ducklings hatched!” I thought he was talking about the school ducklings, and nodded my head. “I counted 13,” he said. Oh god. I ran back to the duck area and checked, yep, one of the sneaky girls hatched out a whole nest of them. Lucky number 13. Sometimes, nature has other plans. 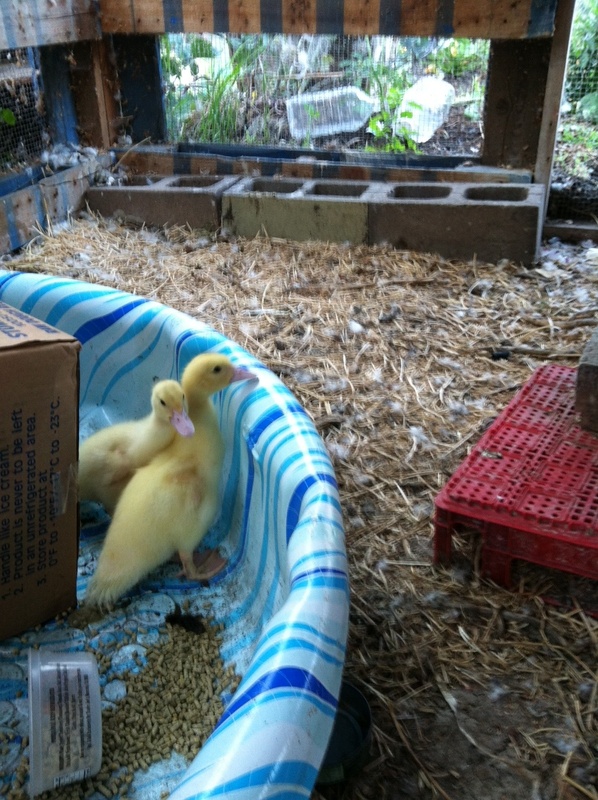 Anyone want to trade (something, anything) for some Muscovey ducklings?